(Fri. 3/30) And when they were come unto a place called Golgotha, that is to say, The place of a skull, they gave him wine to drink mingled with gall: and when he had tasted it, he would not drink. And when they had crucified him, they parted his garments among them, casting lots; and they sat and watched him there. And they set up over his head his accusation written, THIS IS JESUS THE KING OF THE JEWS. 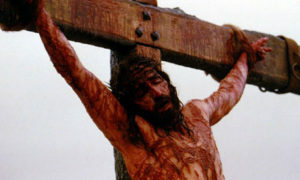 Then are there crucified with him two robbers, one on the right hand and one on the left. And they that passed by railed on him, wagging their heads, and saying, Thou that destroyest the temple, and buildest it in three days, save thyself: if thou art the Son of God, come down from the cross. In like manner also the chief priests mocking him, with the scribes and elders, said, He saved others; himself he cannot save. He is the King of Israel; let him now come down from the cross, and we will believe on him. He trusteth on God; let him deliver him now, if he desireth him: for he said, I am the Son of God. And the robbers also that were crucified with him cast upon him the same reproach. And about the ninth hour Jesus cried with a loud voice, saying, Eli, Eli, lama sabachthani? that is, My God, my God, why hast thou forsaken me? And some of them that stood there, when they heard it, said, This man calleth Elijah. And the rest said, Let be; let us see whether Elijah cometh to save him. And behold, the veil of the temple was rent in two from the top to the bottom; and the earth did quake; and the rocks were rent; and the tombs were opened; and many bodies of the saints that had fallen asleep were raised; and coming forth out of the tombs after his resurrection they entered into the holy city and appeared unto many. Now the centurion, and they that were with him watching Jesus, when they saw the earthquake, and the things that were done, feared exceedingly, saying, Truly this was the Son of God. And many women were there beholding from afar, who had followed Jesus from Galilee, ministering unto him: among whom was Mary Magdalene, and Mary the mother of James and Joses, and the mother of the sons of Zebedee.